Britain’s Prime Minister Theresa May has warned opposing MPs that rejecting her Brexit deal will be risky and lead to “division and uncertainty”. Looking at these comments Sputnik spoke to Eddie Bone, Campaign Director at the Campaign for an English Parliament for his views on these latest Brexit developments. Sputnik: According to the first independent analysis of Britain exit terms, Theresa May’s Brexit deal could leave the UK £100bn poorer each year in first decade outside of the EU. What does this embarrassing ruling mean for Theresa May’s deal? Eddie Bone: It’s an appalling Brexit deal there are so many areas of the deal that people shouldn’t vote for. It’s not just the money, it’s the fact that there is no unilateral decision for the UK to leave that deal and the only way I can explain that is [it’s] like someone being in an abusive relationship and the person says to the partner ‘I want to leave this relationship’ and the abuser says ‘no’ and this is what Theresa May is proposing. We shouldn’t be actually giving huge amounts of money to the EU, we can have rules and regulations put upon us but we will have no ability to leave. I would say that any leaver or any remainer; everyone has to reject this particular deal because we are going to be financially worse off but also because it’s going to damage our democracy in the UK. Sputnik: From left to right, politicians and the general public have united to condemn the prime minister’s Brexit deal. Is there any possibility that her deal will make it through parliament? Eddie Bone: I would hope it wouldn’t but at this present time I don’t think anyone really knows what the outcome will be. We are looking at a group of politicians who are very weak and very divided, there is no true leadership in the UK because Theresa May is so weak and such a poor negotiator. The only hope that we can have is that it is firmly rejected by parliament and that is hope we have to stay with, and then we can actually then go to World Trade Organization conditions so we can start trading properly again. Sputnik: Finally, If not this deal, what Brexit approach should Britain be taking before we leave the EU in March? Eddie Bone: Well, first of all, we need to sort out our own constitutional issues. At this present time, the UK will not survive, we are looking at a situation with the DUP saying they don’t want any borders we’re now looking at the situation with the SNP saying they won’t accept anything unless it is on their terms, and the UK won’t survive. We need to start sorting out our own constitutional issues and that means creating a proper a voice for England, getting the parliament for England and making sure that the devolved governments only talk about domestic issues and don’t start determining their own foreign policy as the SNP are doing at this present time. Once we have sorted out our domestic issues we can then look at Brexit properly; unfortunately, we have run out of time so it’s not Brexit itself, it’s Theresa May’s mishandling of Brexit that has created this constitutional crisis. That’s going to be our number one focus making sure that the UK or England has a proper voice in these negotiations. 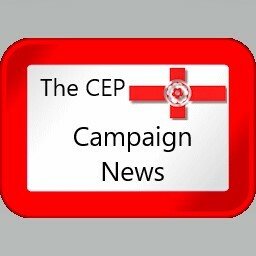 Be the first to comment on "May’s mishandling of Brexit created constituional crisis – Eddie Bone"